The Gold Coast Modular Railroad Club (GCMRC) was founded in 1987 and is an exempt corporation under Internal Revenue Code section 501(c)(7) non-profit "mutual benefit" corporation and was changed to a non-profit charitable exempt corporation under Internal Revenue Code section 501(c)(3), in 2013. The club was based out of a garage until late 1993, when we were able to set up in a large vacant store, rent free, in a Camarillo, California strip mall. The club lost its lease and moved out in December of 1996, just after our last open house. 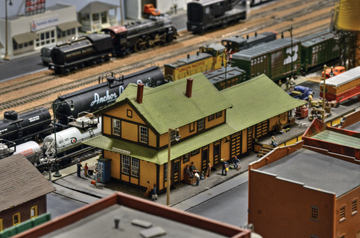 From 1993 to 1996 the GCMRC became recognized as one of the largest model railroads in California, at 4500 sq. ft. with 700 feet of main line track. The Gold Coast Modular Railroad Club is a non-profit organization whose purpose is to educate the general public in Ventura and nearby California counties on the appearance and operations of railroads, and the contribution railroads have made and continue to make in the development of our nation. It will accomplish this goal by designing, constructing, maintaining and operating, for exhibition to the public, scale simulations of one or more actual railroad segments, and by maintaining a multi-media repository of railroad related materials. We set up our exciting scenic display using the modules from our Camarillo setup and newer modules at the California Oil Museum, October 14, 2007 through February 10, 2008. Our layout had been abbreviated from our setup at the Ventura County Fair and was 12 ft. x 27 ft., using the Kaboom Trestle, Coal Canyon and parts of the Golden Valley from the Camarillo set-up and new modules, consisting of a Lumber Processing Mill and Pond, an engine repair facility, a packing yard, slaughterhouse, icing rack and a round house with an operational turntable. Ride the Gold Coast Modular Railroad to the Chattanooga Choo Choo tune ......Video by Frank at the Murphy Auto Museum.